Visit | The Fralin Museum of Art, U.Va. Admission is always free; donations are welcome. The Fralin Museum of Art at the University of Virginia is housed in the historic Bayly Building on the hill overlooking Madison Bowl. The main entrance is accessible only by stairs. However, there is a fully accessible entrance at the back of the building, via Bayly Drive with limited accessible parking spaces. In addition to those spaces, regular spaces may be reserved and used with permission from Museum staff. All galleries in the Museum are accessible by elevator. A wheelchair accessible restroom is available on the lower level. The Museum has a limited number of wheelchairs, and strollers for children, available to borrow during your visit. Please call the reception desk at 434.243.5584 prior to visiting, for assistance with parking and entering the building. For information regarding school group tours with accessibility needs, the visually impaired or other special needs, please contact the Education Department at 434.243.2050. It is important to The Fralin Museum of Art that our exhibitions are accessible to all. If you need accommodations not mentioned here, please call 434.243.5584. 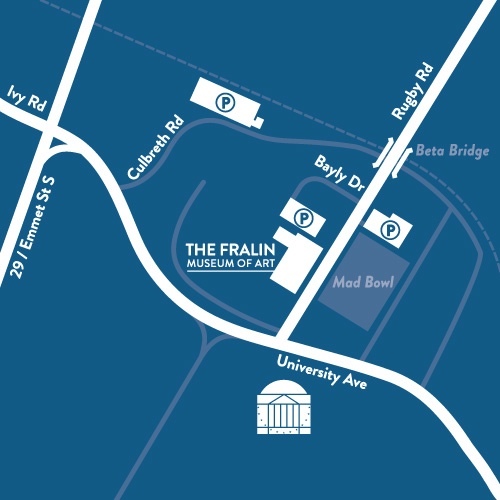 The Fralin Museum of Art is located at 155 Rugby Road, one block north of the Rotunda, on the Grounds of the University of Virginia. Take exit 118B for US-29 North towards Charlottesville/Culpeper. Drive approximately 2 miles, then exit onto US-250 Business East/Ivy Road towards Charlottesville. Turn right and follow Ivy Road for approximately 1.5 miles. At the fifth traffic light, turn left on Rugby Road. The Museum is the second building on the left. Take I-66 from Northern Virginia past Manassas. Take exit 43A for US-29 South/Lee Highway towards Gainesville. Follow Route 29 approximately 69 miles into Charlottesville, where Route 29 becomes Emmett Street. Pass John Paul Jones arena on the right, then turn left onto US-250 Business East/University Avenue. At the first traffic light, turn left on Rugby Road. The Museum is the second building on the left. The Museum also validates parking tickets from the Central Grounds Garage on Emmet Street . FREE trolley service daily between UVA and downtown Charlottesville!